Is it just me or did time fly this summer? One minute I was packing for summer holidays and next I’m preparing a fall post! Let’s start with a grey. The grey that is used in that color scheme is called Sharkskin. I had a similar polish in my stash but I went with a darker grey just to emphasize the silver glitter I used on the tips. This manicure is pretty easy actually, over two coats of grey, I use a makeup sponge to dab some glitter polish on the tips. Here’s an extra tip; I paint the sponge with glitter polish, this way the excess base is absorbed and you are left with pure glitter to dab on your nails. Don’t forget to use a fast drying topcoat to seal the layers. For the second look, I chose the dark dusty blue called Riverside. Again, two coats of polish and topcoat. This looked more dusty in real life. 😮 For the accent nail, I used nail art stickers you can find at any beauty store. The one I used was clear and had tiny silver stars on it. I picked one that suited my nail size and after applying it on, I trimmed the excess. This is an easy and fast mani for busy days, but unfortunately, the stickers don’t last long compared to stamping. The third color I picked from the Fall color scheme was called Bodacious. It is a bright rich purple with a hint of pink. 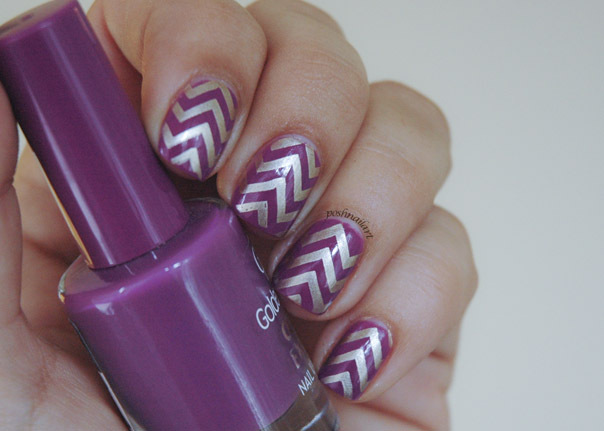 I used this one with a silver stamping polish and chevron image plate. And finished the look with a fast drying top coat. And saved the best for last. Actually this one is my favorite. 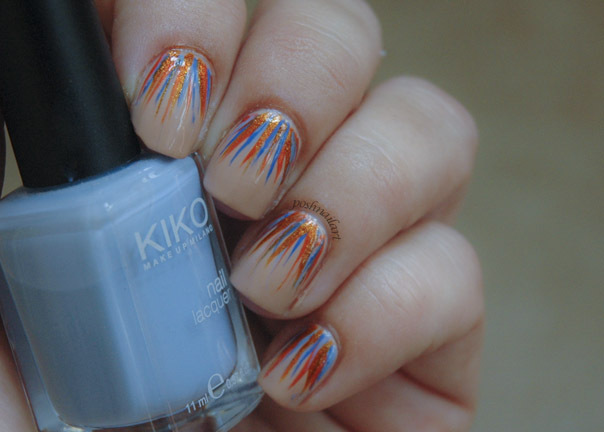 It looks so subtle and yet so noteworthy on my nails. This one got lots of compliments, as well. It is a technique by the lovely Nailasaurus called the Waterfall nails. I picked out a taupe polish for my base. For the waterfall colors, I chose dark blue, light blue, spicy orange and metallic orange that looked like the ones from the Pantone scheme. With a thin and long bristled brush, I made strpies from the base of my nailbed towards the free edge. 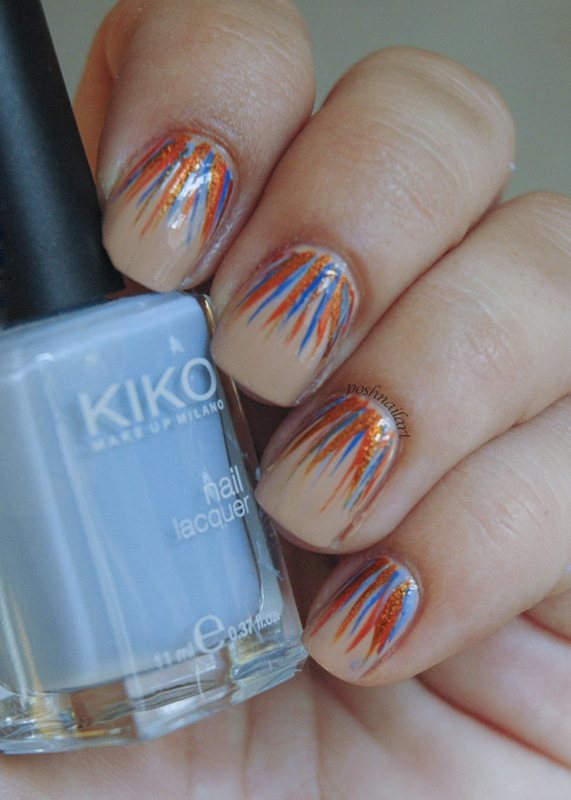 When I was satisfied with the look, I finished it with a fast drying topcoat, as usual. And that’s it for this month. 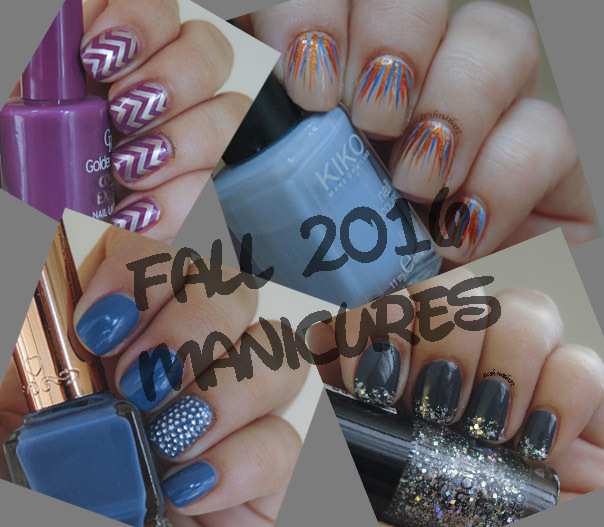 Start getting ready for fall with these manicures and we’ll think of something else for October! 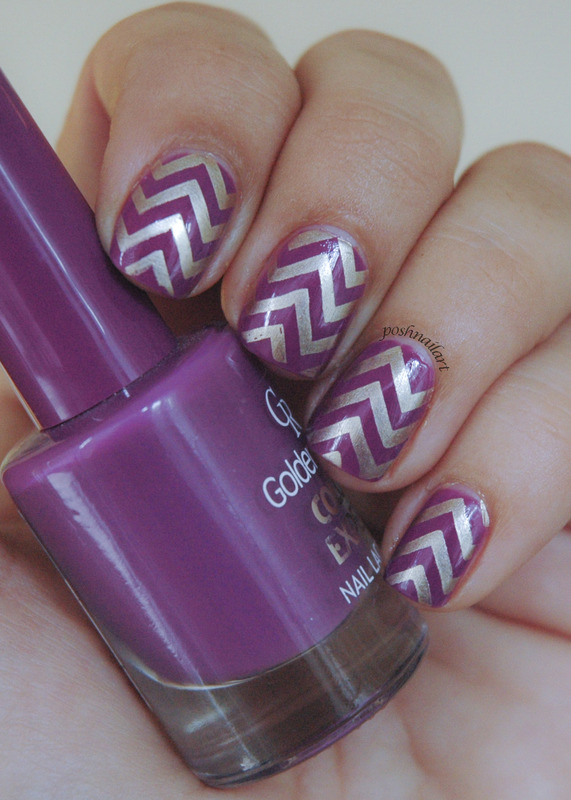 Untill then, visit Posh Nail Art blog for more ideas.